Another Original Blog: Kids television. A logo and a 3 second burst of music has inspired me to write something today. That Thames television logo just brings it all back. Following it was the unforgettable theme tune to Rainbow, followed by the anarchic voice of Zippy…..they say nobody is bigger than a television show (okay, I've never actually heard anyone say that as it’s not actually true….I mean Big Brother would never have survived without Davina McCall…. ), but without Zippy, Rainbow would have been quite bland really. Citv’s retro revival weekend a couple of years ago was heaven for me, anyone who knows me (come on, there must be someone! ), will know I have an unhealthy obsession with nostalgia. What’s struck me about most of the programmes was that there seemed to be a much better balance regarding mood. As well as the proverbial happy, cheery main presenter, there always seemed to be a slightly sinister, cynical, moody acquaintance. This seems to be missing from today's offerings. The problem with providing children with 100% happy television is that it’s not really preparing them for what the world is really like. 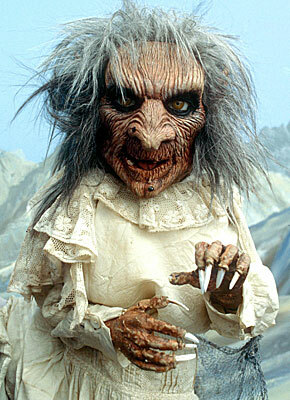 I remember being terrified by Zelda from Terrahawks (I still am, check her out, that's scary! )…..did this help prepare me for adult life? Probably not, but I find ’aesthetically challenged’ people far easier to tolerate having been subjected to Zelda’s cackling face every saturday afternoon. Seriously, if they showed reruns of Terrahawks this weekend, there’d be a deluge of letters of complaint, maybe even mass seizures. Just look at that face! 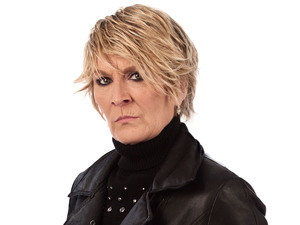 She only appears on Eastenders these days, see Shirl. The problem is that I'm already starting to disagree with my notion that the world was far better back in ‘my day’….and that I’m just churning out the same garbage that I used to hear from the older generation when I was a kid….are things actually getting worse? Is kids TV just pandering to a world that is suddenly afraid to offend or speak from the heart? Am I overthinking all this? This is a different conversation altogether. What I do know is that the lack of health and safety (see Fun House), the free speech and more adulty dialogue (Going Live, Live & Kicking etc), sexual innuendo’s (Gamesmaster), proper talent (Neil Buchanan – Art Attack), groundbreaking idea’s (Knightmare), unintentionally terrifying characters (Moomins, it wasn't just me was it?!) and so much more, made for a line-up of television that is still fondly remembered by many people of my age group. The theme tunes, characters and genuinely off the cuff personalities were truly memorable and todays programmes leave a lot to be desired, with the exception of Justin/Mr Tumble who seems to be an absolute genius and is clearly fantastic at connecting with children, especially those with learning disabilities. I must admit that I subject my kids to a lot of the old programmes, but they love them! I couldn't help but wonder why millions are spent inventing new formats. Just start the programmes from 1982 and press the reset button every 15 years….I think we can all agree the world would be a better place. Just leave out these creepy things.